Based on the memoir of Maria von Trapp, The Story of the Trapp Family Singers, 'The Sound of Music' isset in Austria on the eve of the Anschluss in 1938. The musical tells the story of Maria, a postulant who proves too high-spirited for the religious life and so takes a job as governess to a large family while she decides her future. She falls in love with the children, and eventually their widowed father, Captain von Trapp. He is ordered to accept a commission in the German navy, but he opposes the Nazis. How will the story end for Maria and the Von Trapp family? 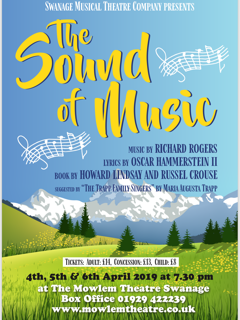 Including the songs Edelweiss, My Favorite Things, Climb Ev'ry Mountain and the title song "The Sound of Music", this classic family favourite performed by Swanage Musical Theatre Company is a must see.